Taken 2, the blockbuster sequel, is now available on DVD/Blu-Ray. 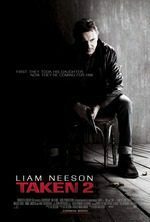 The sequel to Taken follows the retired CIA operative Bryan Mills (played by Liam Neeson) to Istanbul where he and his wife are taken hostage by the father of the kidnapper Mills killed in the first movie. This is a pure action movie – nothing more, nothing less. The film has received many positive reviews. Together, both movies grossed well over $100 million at North American theaters. They are rated PG-13 for intense violence, sexual content, references to drugs, and strong language. Taken 2, released yesterday on DVD and Blu-Ray, owes its existence to the wild success of the first film. Most films are considered a hit if they generate three times their production cost – Taken only had to make $75 million to meet that mark and ended up grossing $226 million. The sequel cost $45 million to make, but generated an even better return than the first movie, raking in over $370 million worldwide. Taken 2 is priced at $16.99 for DVD and $19.99 for Blu-Ray from both Best Buy and Amazon. Did you catch these films in the theater? Let me know how you liked them in the comments below!